The Academic Innovation Fund has supported the creation, implementation and evaluation of a number of EE projects. Projects are showcased on the Academic Innovation Fund website. York University provides a wealth of resources to assist educators in developing and implementing EE projects. A complete list of resources can be found on The Teaching Commons website. Descriptive terms and a common language were developed to identify Experiential Education (EE) strategies and facilitate conversations about the range of possibilities for innovative use of EE in teaching and learning. With subway construction underway at York, it seemed appropriate to use this analogy to illustrate how we are building new systems to support student learning. This experiential education strategy allows students to apply theory and course content to concrete experiences that encourage reflection and conceptualization. These experiences not only encourage active learning but also include structured reflection, encouraging the student to refer back to the experience in an effort to make sense of it by considering relevant course material. These concrete experiences could take place within the classroom or outside the classroom through observation, reflection and practical applications. They are combined with purposeful reflective learning exercises such that the experience is considered in relation to the concepts/theories addressed in the class.Wherever they occur, they count as classroom-focused EE because they prioritize student learning outcomes over reciprocal impact within community. Note: There are forms of Community Service Learning that are co-curricular in nature. They often include volunteering opportunities for students. In these forms, CSL is not-for-credit. For our purposes, we are addressing only academically embedded CSL. In course-based placements, students have the opportunity to develop competencies and skills and augment the theories/concepts learned in their course by getting hands-on experience within organizational environments. The learning emphasizes career exploration and employability/professional skills development (HECQO, Practical Guide for WIL, 2016). (e.g. Communication, Disaster & Emergency Management, History, Portuguese, Public Policy & Administration, Work & Labour Studies and Urban Studies). Students must complete this placement in order to complete/pass the course. They receive course credit but are not (generally) paid. In program-based placements, students are given the opportunity to develop competencies and skills in organizational work environments that augment the theories/concepts learned in academic program settings. Students apply theories and concepts from their program work in a practice-based work environment and reflect upon their actions. Students engage in activities where they practice the discipline or program specific competencies; they receive program credit for doing so but (generally) are not paid. Program-based placements are also known as fieldwork, field placements or practica (e.g. Education, Nursing, Social Economy or Social Work). Internships provide students with the opportunity to augment the theories/concepts learned throughout their degree and develop competencies and skills through hands-on work experience related to their field of study. Internships are paid, full-time, one-time, supervised work experiences in which learning is assessed via the student reflecting on their internship experience in the workplace and writing a work term report, which is then reviewed and graded by the faculty supervisor. Internships are generally associated with academic programs that include a practice, service or professionally oriented applications. The student completing multiple work terms is normally exposed to the work environment during more than one season of the year." A baseline survey conducted in 2011-12 provides insight into the extent to which EE strategies have been used across the continuum from course focused, community focused to work focused. 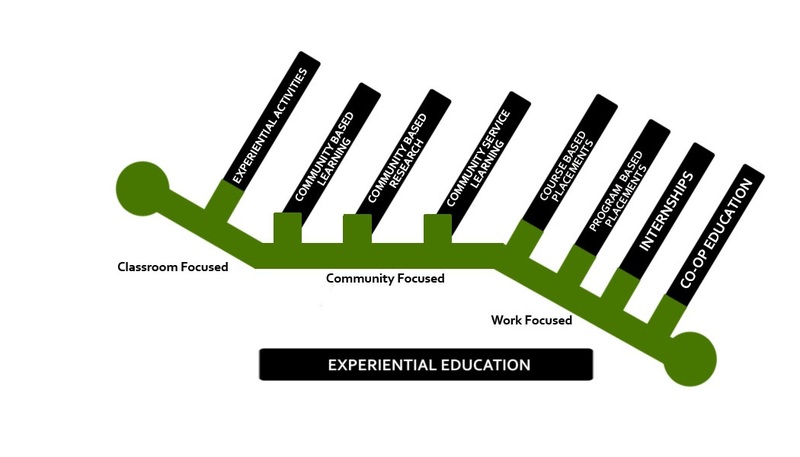 The University’s Academic Plan (UAP) (2010-15) and the Provostial White Paper (2010) both cite the need for growth in experiential education. The pursuit of academic quality has been consistently identified as being one of the highest academic goals across a number of university academic plans (e.g., UAP, 2005 – 2010, UAP 2010 – 2015). In the UAP, the enhancement of teaching and learning is seen to be an essential component in terms of advancing academic quality and ultimately, student success. It identifies three priority areas: (i) enhancing teaching and learning, (ii) enriching the student experience and (iii) building community and extending our global reach. Across each of these broad priority areas, experiential education can be seen as a vehicle to facilitate learning. In the Summer of 2013, the Experiential Education Working Group was established to provide advice to the Vice-President Academic and Provost on the integration of experiential education approaches in York’s degree programs. The Working Group has developed a discussion paper to serve as a tool for consultation with Faculties, students and community partners to encourage conversations about the use of experiential education strategies to enhance student learning. The consultations took place in November 2013 with Faculties, students and community partners. The Working Group welcomed feedback from the York community at an Open Forum or via the attached online feedback form. Following these consultations, the EE Work Group developed a Common Language for EE as well as the EE Integration Summary and Recommended Actions which was followed by a draft of an EE Operational Plan and the establishment of an EE Leads Group in March 2014 with representatives from each of York's Faculties. In the summer of 2014, the EE Leads conducted reviews of all of the EE activities currently taking place within their Faculties with an eye to establishing targets for increasing York's overall EE offerings. This information will be used to create a Business Plan that will outline infrastructure for EE at York.